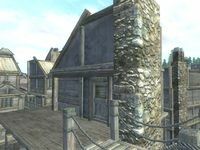 City Swimmer's House is located in the north-east of Bravil, opposite the Silverhome on the Water. Occupied solely by City-Swimmer, and consisting of only one zone: City Swimmer's House. 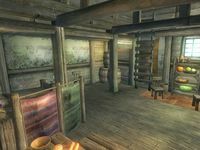 Her apartment is a typical lower-class Bravil affair, with the usual ingredients and clutter, although you will find the sneak skill book 2920, Last Seed on a chest of drawers and a Nirnroot at the foot of the bed. There is also an unlocked chest with a chance of up to three leveled pieces of equipment and a barrel in the southwestern corner with a slim chance of some jewelry. Esta página foi modificada pela última vez à(s) 16h57min de 1 de fevereiro de 2014.